Spokane’s private employers face fines for asking about an applicant’s criminal history before an interview, starting in 2019. After roughly two hours of testimony from felons who had difficulty finding work and social justice groups arguing the policy would lift the initial barrier for those hoping to avoid relapses into crime, the Spokane City Council voted 5 to 2 on Monday night to “ban the box” within city limits. “We’re going to put a stake in the ground for community reconciliation, in our city, and across the state, and across the nation,” said City Councilman Breean Beggs, who took the lead on writing the legislation, when it was clear a majority of the council would support the proposal. Beggs, City Council President Ben Stuckart and City Councilwomen Lori Kinnear, Karen Stratton and Amber Waldref voted to approve the ordinance, which won’t be enforced with proposed $261 fines for noncompliant businesses next year, Beggs said. City Councilman Mike Fagan and Councilwoman Candace Mumm cast the votes against the measure. A cavalcade of supporters addressed the council Monday night, organized by the group I Did the Time, which has been pushing for its passage locally and at the state level for years. “All I can really say, is this happened because people who faced huge shame and stigma decided to speak up and say I don’t think this is right anymore,” said Layne Pavey, an organizer with the group, after the vote. Pavey, a felon convicted of drug crimes, embraced fellow supporters after the vote and posed for selfies outside the council chambers once the vote was read. 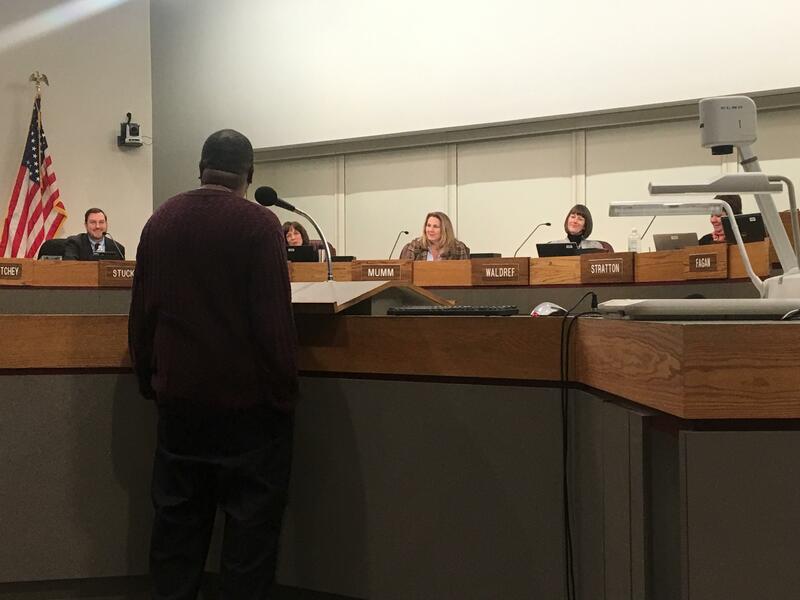 Kurtis Robinson, president of the local chapter of the NAACP and also a felon, applauded passage of the “ban the box” ordinance but said more work needed to be done to reform the criminal justice system and racial disparity in prison populations. Council members who had expressed some hesitancy last week because of efforts at the state level to address the “box” issue said they were moved by the testimony Monday night, which was overwhelmingly in favor of the proposal. Only one speaker, frequent commenter George McGrath, spoke against the ordinance. Employers could face enforcement action after the one-year probation period if they advertise for jobs indicating felons aren’t allowed to apply, if they include a question about criminal history on applications or ask about it before conducting a job interview. The city of Spokane banned the box on its public employment applications in 2014, and earlier this fall the Spokane County Commission opted to do the same. Stratton thanked those employers who spoke in favor of the proposal Monday night before the council. “My big concern is that we spend the next year, when we pass this, really working with our business community,” Stratton said. Mumm said she believed the issue was best handled at the state level, despite voting for the city’s policy guaranteeing sick leave late in 2015. The councilwoman said at that time, it didn’t appear the Legislature was going to act on that issue. “In this case, some of the information I’m receiving is that the state is actually probably going to act. In fact, it could be early action,” Mumm said. Mumm, a former KXLY broadcaster, said she also believed employers could conduct simple internet searches if they want to find out about a person’s criminal history, given the abundance of media coverage of crimes. Stuckart dismissed claims the city should wait for the state to act on the issue. “I didn’t run for City Council to rely on the state to act and do something,” the president said. Fagan, who said last week he supported the concept of a “ban the box” ordinance, said he couldn’t support the legislation because he believed it dictated how businesses must conduct job interviews. “What may have seemed to be a simple change to an employment application at the onset of this discussion to ‘ban the box,’ will actually require a significant shift on the part of businesses, in their hiring practices and procedures,” Fagan said. Bill Keizer, a member of the group I Did the Time and one of the owners/operators of the assistance group Revive Reentry Services for felons leaving incarceration, said he met with Fagan last week and believed the staunchly conservative council member was on board. Before the meeting Monday night, a bloc of council members successfully amended Beggs’ proposal to allow employers to conduct telephonic interviews of applicants before inquiring about criminal history. Beggs said he didn’t include phone interviews in the original version of the bill because it could be seen as a way for employers to get around the intent of the law by conducting a de facto criminal history screening. “The fear was that people would, instead of having the box, they would simply call people and say, ‘Do you have a criminal record?’ And if they said yes, they would just say, OK, that’s our telephonic interview, before giving them a chance to explain,” Beggs said. The motion to include telephonic interviews was made by Mumm, and supported by Kinnear, Waldref and Stratton. Beggs, Stuckart and Fagan voted against the change. Pavey said she was disappointed the council allowed that change. “You cannot build a relationship with someone, and trust, the same way over the phone that you can in person,” Pavey said. Beggs made changes to the proposal he believed would appease the business community, including delaying enforcement for a year while providing employers with information on how to comply. Still, Todd Mielke, the head of Greater Spokane Inc., said last week he had concerns about how the measure would be perceived by businesses hoping to locate in the city. The law does not prevent businesses from conducting background checks or supplant state and federal laws that require background checks for certain professions, including working with unsupervised children. Published: Nov. 27, 2017, 10:26 p.m. Updated: Nov. 27, 2017, 11:02 p.m.